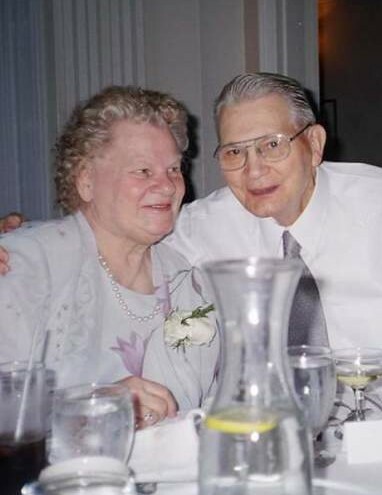 Edith Jeanette (Anderson) Laws, 89, of Coventry, beloved wife to the late Wallace West Laws Sr., passed away Saturday, February 9, 2019. Edith was born in Hartford on January 31, 1930 to the late Eric and Alice (Johnson) Anderson. Edith was a very kind, sweet, warm-hearted individual. She accepted everyone with open arms. Family was very important to Edith. She loved her children and grandchildren very much. Time spent with her family was such a joy and pleasure to her and family gatherings would put a smile on her face every time. Edith is now dancing in heaven, reunited with her one true love. Edith is survived by her three children, Wallace W. Laws Jr. and his wife Debbie, Betty Pranckus and her husband David and Brian Laws and his wife Mary Jane of FL; as well as many loved grandchildren, great-grandchildren, nieces and nephews. In addition to her husband and her parents, Edith was predeceased by her two sisters, Florence Slater and Margaret Nascimbeni. A time of visitation will be held on Thursday, February 14, 2019, from 10-11 a.m. at Manchester Funeral Home, 142 E. Center St., Manchester, with a funeral service to begin at 11 a.m. at the funeral home. Burial will follow in East Cemetery, Manchester. Memorial donations in Edith’s name may be made to the American Cancer Society, 825 Brook St., I-91 Tech Ctr., Rocky Hill, CT 06067 or to the American Legion Post 40, East Windsor, CT. To leave an online message of condolence for her family, please visit www.manchesterfh.com.